CTC GO! is an educational program consisting of several modules that can be combined to teach different STEAM (Science, Technology, Engineering, Arts, and Mathematics) subjects. The whole program is tailored for ages 14 to 17. What Does Every Module Include? TOOLBOX: All the materials to build several guided experiments and projects per module for a class with up to 24 students. 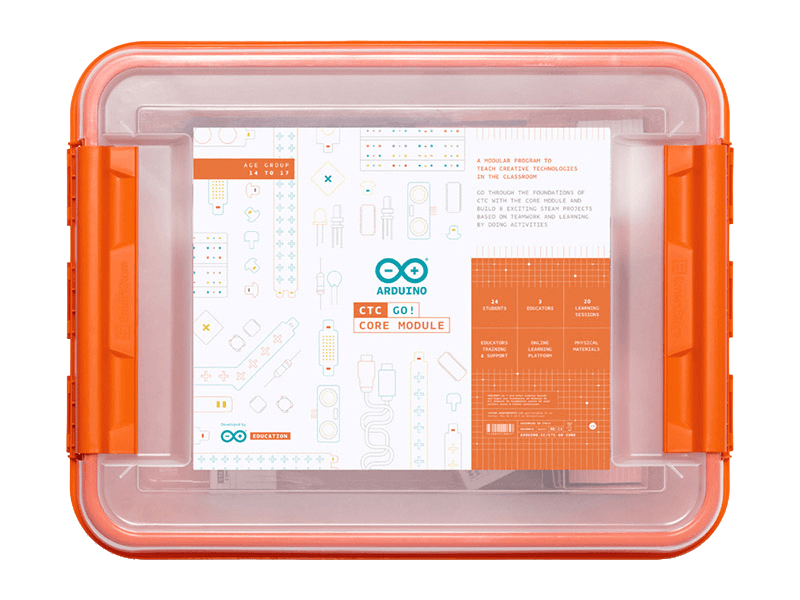 ONLINE PLATFORM: Access to the Arduino Education Learning Management System with step-by-step instructions and lessons for 24 students and 3 teachers. PREMIUM TRAINING AND SUPPORT: Online welcome training webinar with an Arduino Education expert, training video lessons explaining concepts that the educators will use with the students, extra knowledge video pills which expands the content of the lesson plans and a support email to get the assistance of an education expert. With the Core Module you will go through the foundations of CTC and build 8 exciting projects based on teamwork and learning by doing activities.